Are you ready to have some fun? AND create awesome Mariner’s Compass style blocks using an easy technique that marries improv piecing and traditional blocks for amazing results?! Great! This class is a “trial run” of the pattern, so please be aware, going into it, that there may be mistakes and changes to the pattern. 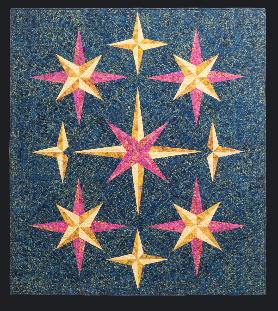 Come try Compass Points class - a soon to be released pattern using Tammy Silvers’ guided improv technique to create beautiful, yet imperfect mariner’s compass blocks.